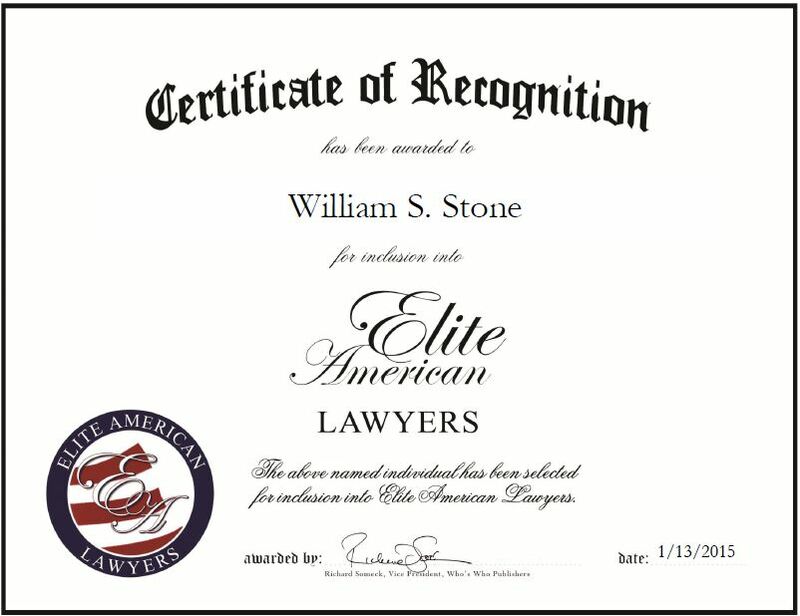 Atlanta, GA, January 13, 2015, William S. Stone, Partner at Boone & Stone Trial Lawyers, has been recognized by Elite American Lawyers for dedication, achievements and leadership in complex civil litigation. A trial lawyer with 37 years of experience, Mr. Stone specializes in product liability, wrongful death, professional malpractice, personal injury, commercial and consumer fraud cases. He is a fourth generation lawyer who runs the firm his grandfather founded in 1915. In his role, Mr. Stone focuses on business aspects and does extensive trial work. He takes great pride in providing clients with top-notch legal services and assisting individuals who need his help. Mr. Stone also dedicates his time to mentoring a fifth generation lawyer, and staying active in the legal community. He has served on the Georgia Judicial Nominating Commission, which recommends candidates to the Governor for appointment to vacant judgeships in Georgia. Additionally, Mr. Stone has lectured at seminars and spoken about trial practice and tort law, while also publishing a number of articles. His exceptional work has gained him recognition from Martindale Hubble Law Directory, which awarded him the highest rating (AV) for legal ability and integrity. He was also named a Super Lawyer in 2002, Attorney of the Year, and the firm was recognized by U.S. News and World Report as one of the best law firms. To stay current in his field, Mr. Stone is a member of the Georgia Trial Lawyers Association, the American Bar Association, the State Bar of Georgia, the Alabama State Bar, the American Association for Justice, and the Southwest Georgia Trial Lawyers Association. This entry was posted in Civil Litigation and tagged fourth generation lawyer, product liability, Super Lawyer, trial work, wrongful death. Bookmark the permalink.